Marriage as we know it today gradually replaced arranged marriages in Shanghai after the Marriage Law of the People’s Republic of China was issued in May 1950. Marriage customs changed and evolved accordingly. A classic dowry a bride could bring to her groom in Shanghai in the 1970s were “three rollings and one roaring.” The three “rollings” were a watch, a bicycle and a sewing machine, whereas the one “roaring” was a radio. The watch had better be the Shanghai brand, the sewing machine either Bee or West Lake brand, the bicycle a Flying Pigeon or Forever. The old three pieces were replaced by three new pieces — a television, a washing machine and a refrigerator. Taking wedding photos became the fashion. Every year novel wedding ceremonies took place. Couples joined group weddings in front of the liberation memorial on the Bund, or they saved some of their wedding budget to help the poor and the needy. The bridegroom would prepared some golden jewelry such as rings, earrings and necklaces, and decorate his wedding apartment simply. The new three pieces were updated to the three big pieces — a color television, air conditioner (or motorcycle) and a video recorder (or VCD player). Starting from 2000, the wedding customs became diverse, a mixture of Chinese and Western styles and characteristic of the couple’s own personalities. Poolside weddings, tree-planting weddings, travel weddings, among others, are examples of innovation in wedding customs. 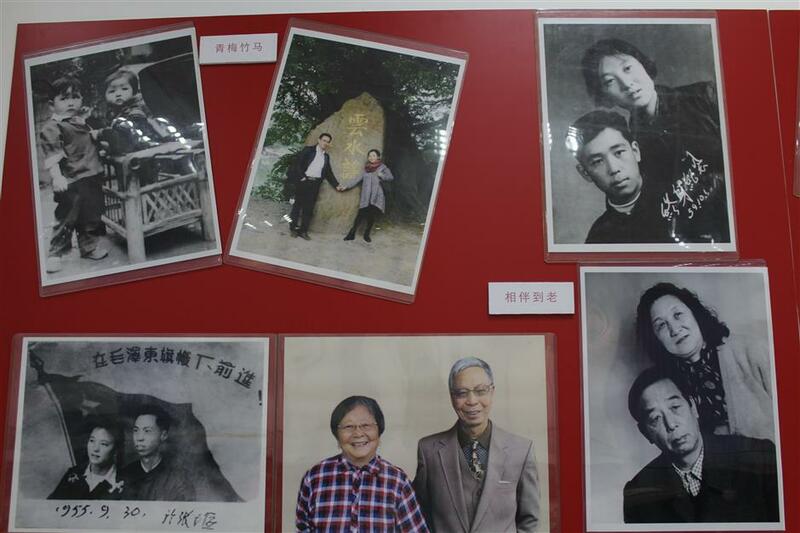 A wall full of couples' photos at a wedding exhibition at the Putuo Civil Affairs Bureau.